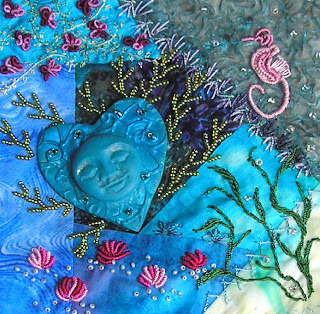 I am in a rr at CQI (Crazy Quilting International) that is focused on faces. Nicki is enamoured with UTS so I tried to bring in a bit of that flavor for her. I have taken pics of both her block and then one of all her blocks together! 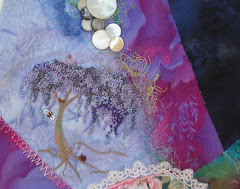 She's got a start for a wallhanging! Enjoy! Finished up Debbies block! I was enamoured by a vintage postcard that had a car full of dolls and teddy at the wheel, so I adapted it to a front on view! I used an old earring for the steering wheel, sewed down mop buttons for the headlights and glued shisha mirrors on top of that. Hope you like it Deb! I finally finished Dimity's (aka Diane) second block in the faces rr at CQI. I used re-purposed necklace for the head piece and a re-purposed earring for the necklace. 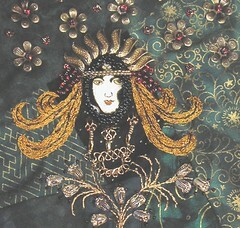 I then embroidered the hair, secured Dimity's cloisonne' face with a peyote cabachon treatmentand beaded things up! I hope that she enjoys the block! I finished this up so it could fly to its new home. 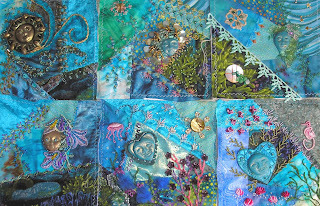 I'd have loved to embellish more and more and more.... but, gotta stop somewhere! Hopefully the new owner will enjoy it! Terrible pic, but this is an update on the little wall hanging I did. I added a beaded border aroundthe frame. Its flying to its new home now! 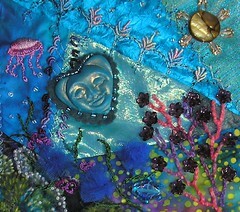 Just a bit of whimsy I thought I would share! I have fallen in love with these little fairies that are made by Mark Roberts. They aren't all specifically Christmas but I just had to add them in with their other friends! One is a sugar plum fairy chef, another a gardner and a pumpkin.... they are all sooo fun! Enjoy! Debbie Quirion's son and daughter in law recently lost their home to fire. 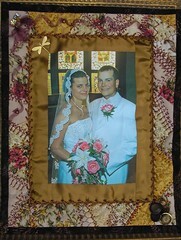 I decided to create a wall hanging for them based on their wedding picture. I added a cq frame, printed the picture on cotton, beaded the bodice and veil or the bride and embellished the frame! Now to get it off in the mail! 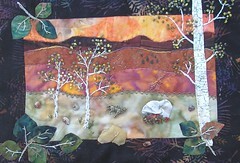 I am stitching my fingers off, completing small gifts for crazy quilting friends. This is for a friend....can't say "who" right now. VBG! 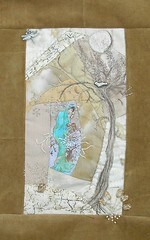 This is a silkie printed from a Mucha poster and embellished. 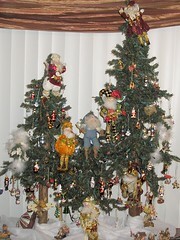 I'm rather fond of this one...must be the tree! LOL!! I am sewwww excited! Things are coming together and i'm getting gifties done and mailed. Only have one left! PHEW!! 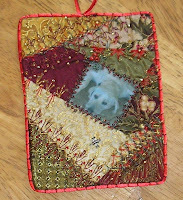 This is a pincushion I made for a friend from CQI (crazy quilting international). She loves pink, victorian, lace, etc. 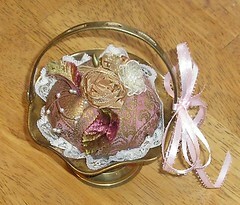 This is a little brass basket I buffed up and then added the pincushion too. 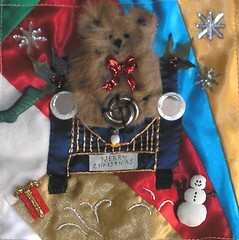 The next pic is of the christmas cracker I made up for her. The pen gives you an idea of what a monster it was! ROFLOL!!! She has received everything and loved it so i'm safe to show it here! I'm very happy she is pleased with her pressies! WOOHOO!!! Things are finishing up and IN THE MAIL!! YEAH!!! Hmmmm.... can you tell i'm happy??? ROFLOL!!! 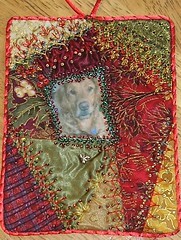 This is a special giftie to Linda of her furkid.... the next one is Puck who is my vets furkid.... love em both! NOW...off to make some for my kids! :_) Enjoy!